People across the US state of Hawaii received a text on Saturday morning, warning of an impending missile strike. It was declared a false alarm shortly afterwards, but not before panic started to spread. “Ballistic missile threat inbound to Hawaii. Seek immediate shelter. This is not a drill,” read the message, all in capital letters. Hawaii Emergency Management Agency later confirmed there was no threat. 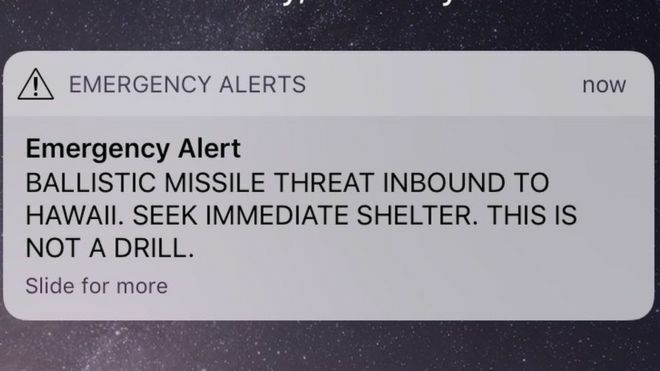 The Honolulu Star-Advertiser said emergency officials had mistakenly sent the message out by text at 08:07 (18:07 GMT) before correcting the error by email 18 minutes later. There was no follow-up mobile text until 38 minutes after the original alert, it said. It was unclear how the initial mistake was made. In December, Hawaii tested its nuclear warning siren for the first time since the end of the Cold War. It came amid a growing threat from North Korea’s missile and nuclear programme. Hawaii is the closest state to North Korea. In September Pyongyang carried out its sixth nuclear test. Last month, the Star-Advertiser also reported that a missile launched from North Korea could strike Hawaii within 20 minutes of launch.